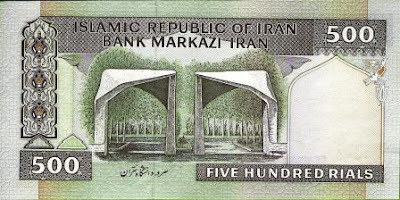 I got this Iranian 500 Riyal note when I was in Iran in March this year when I attended the Asia-Pacific Housing Ministers meeting in Tehran. In fact I got the entire Islamic series as well as the Pahlavi series. I could not get the pre Pahlavi series as they were too expensive. However this Islamic series is interesting. I don't think there is any other currency in the world showing a group of people praying be it Islamic or otherwise. 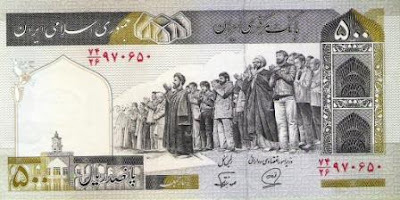 Though this 500 Riyal note is not worth much as the Iranian currency has weakened since the days of the Shah of Iran. I found another old 500 note in my currency notes collection. This one is from Cambodia bought by my sisters when they went to Angkor Wat. 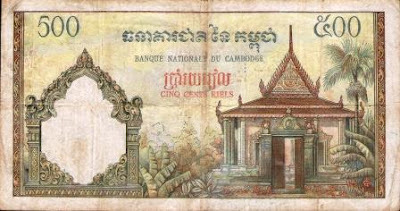 I was once in Cambodia attending an ASEAN meeting but at that time, I was not into notes collection and I only used US Dollars there. 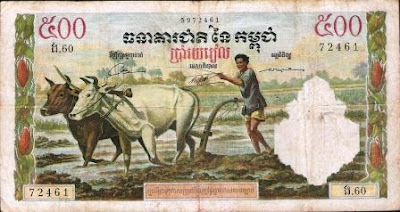 This particular 500 Riel note is quite old (around 1970) and no longer in use. But it had an interesting painting and not many countries have paintings on their currency notes. The interesting bit about Cambodia is that by 1975 when Khmer Rouge ran the country, the country did not use money. It was not until 1980 when Cambodia was taken over by Vietnam did the country has money again. Talking about 500 note, I had a rare surprise last month. Over the last few months, I had asked my banker nephew to keep a lookout for paper notes. One day he text me and send a photo image of this $500 Singapore note which had come through its branch and asked me whether I would like to have it. Would I?! I certainly would. I dropped at his bank in lunch time, handed him $500 worth of Brunei money and got the $500 Singapore note. It is not a good note though but a used one and I would grade it around F/VF. But it is certainly a rare example of a Singapore ship series note making the rounds in Brunei. This one will certainly not be returning back to the Monetary Authority of Singapore. 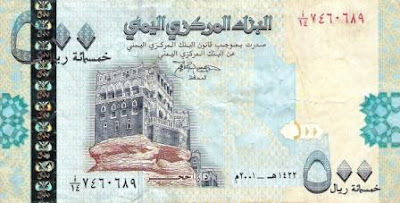 When I posted the Qatar 500 Riyal yesterday, I remembered this Yemeni 500 Riyal which I got when I was in Singapore recently. I was at a money changer when I saw this 500 Riyal in his glass cabinet and asked whether I could buy it. I can't remember what the cost was but it was relatively cheap and I managed to buy it. The colour and design really reminded me of that Qatari 500 Riyal. What do you think? My DM went to Qatar in November and I asked his PA to get me Qatar's 500 Riyal note. When I went to Qatar in January earlier this year to lead the negotiation team for Brunei-Qatar Avoidance of Double Taxation Agreement, I forgot to save the 500 Riyal note. I think I did but I had to pay for something on the last day and I had to use it. This time round, I made sure that I got the 500 Riyal note which is worth just slightly more than B$200. The note is a polymer and had a small window in the middle of it. 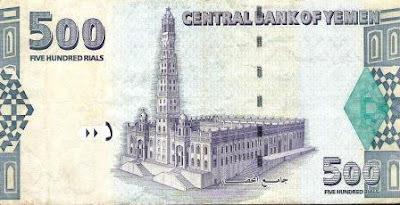 This is like the new Qatari 100 Riyal note. The Qatari notes have a special place in my life. It was the last country I went to as a Ministry of Finance official. The day after I arrived back in Brunei, I was promoted to my current job. I purchased this very recently through ebay. This is a 100 Yuan Foreign Exchange Certificate (FEC). In the days when the Yuan was not allowed to be change in the open market, foreigners going to China had to buy this FEC note from the government thus paying whatever official exchange rate that was in force at that time. It also limited the holder to shopping at certain places only. This FEC note is now very very difficult to get. Every now and then to calm my nerves trying to win bids for Brunei dollars and stamps on ebay, I would go and bid for the Disney dollars. Disney dollars are more fun and less stressful. The above are the ones released for 2008 and in time for Disney's 80th Anniversary. Disney dollars are reasonable but the older ones are rising in prices. What are Disney Dollars? Disney Dollars were released to the public on May 5th., 1987. Disney Dollars came in one and five dollar denominations from 1987 thru 1989. Starting in 1990 they added the Disney ten dollar bill. Disney Dollars are redeemable for goods or services at the Disney theme parks, Disney cruise ships, and the Disney stores. Disney Dollars are printed in "A" dollars and "D" dollars. The "A" Disney Dollars created for Disneyland in Anaheim, California, the "A" refering to Anaheim, and the "D" Disney Dollars for Walt Disney World in Orlando Florida. Starting in 2005 Disney Dollars are also available as "T" dollars. Also In 2005 , Disney offered a Fifty Disney Dollar bill that was designed by Disney master artist for 39 years, Charles Boyer for Disneyland's 50th Anniversary Celebration. Charles Boyer also personally signed a select number of these. In 2007 "E" & "F" prefix Disney Dollars were added. Disney Dollars are beautifully printed in bright, vibrant colors. The intaglio printing process used to print Disney Dollars allows you to "Feel The Steel" on the paper, as banknote engravers would say. Disney Dollars are much sought after collectables by Disney collectable fans. 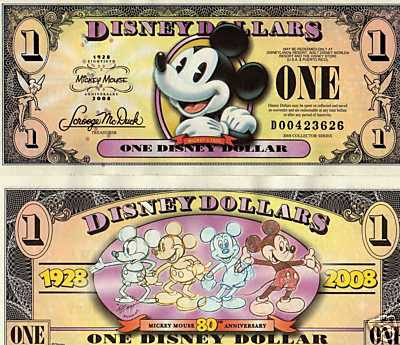 New Disney dollars have been produced every year since 1987 except 1992, 2004 and 2006. Disney Dollars can be exchanged dollar for dollar with US currency. The Disney Dollar is a source of revenue for the Walt Disney Company as it is assumed a certain number of Disney dollars will never be redeemed, and will be gobbled up by collectors. Over the last week, I have been tracking and bidding on this rare 6c Brunei stamp Japanese Occupation. Yesterday I lost it. My final bid was GBP400, the winning bid was GBP411, I think. This is one of the last four Brunei stamps which I am trying to get. 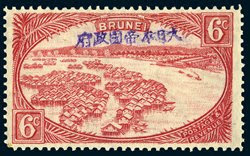 These are the highest values of the entire Brunei collection. This 6c stamp only comes out once in a blue moon. Scott listed it at around USD775. The next time this comes out, I am not going to play nice. For those who kept with my other blog would have known that I have spent the last 6 days in Singapore. And numismatically, it was worth the 6 days. I managed to get a few notes especially older Brunei and a number of other notes as well. But I thought the one I posted above takes the cake. This is a Singapore $10,000 genuine specimen note. The only difference between this one and the one in circulation (if you can find any) is that this one has the word specimen on it. According to my numismatic dealer, this note was available for $180 when it first came out. Of course, it is not $180 anymore when I paid for it. According to my dealer too, apparently some of these specimen notes were taken to one country and over there they managed to wipe off the word specimen and then changed each note for an actual $10,000. I have never heard of this story but if this is true, I am not surprised that the story was not publicised. No one wants to look like a fool and at the same time no one wants many people to find out that these $10,000 specimen notes are actually worth something more than the original price of $180. On a separate note, if you were to find a Brunei $10,000 specimen note, how much do you think you would have to pay for it? Well, the price on ebay is at least $10,000.